Handy little wood working power tools that I use in finish carpentry that have saved me time, money and work. These tools are not just for finish carpentry or wood work they have multiple uses in other applications and are even handy to have around the house. 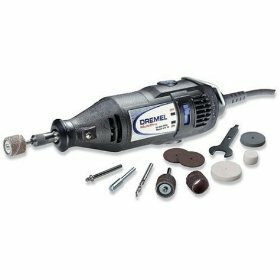 The Dremel tool is just one of these tools. This little power hand tool has many uses and it rarely gets the credit it deserves. I have four or five of these and even have a cordless model. The little device has almost replaced my coping saw. When you are installing baseboard for example the best way to do an inside corner is by coping. If you don't know or don't understand what coping is go to this page coping baseboard and find the instructions and pictures that explain this method of baseboarding an inside corner. Coping also applies to other forms of trimming and this may include crown molding chair rail and shoe or quarter round for a couple of examples. Some times a coping saw will be needed with these other types of trim. However I have found that the dremel tool with different sized sanding drums attached can and does the majority of the work by removing the material needed to make perfect copes every time. Coping is just one example of where I use the dremel tool regularly; there are other areas in finish carpentry where this hand power tool comes in very handy. Return From The Wood Working Power Tools Page to Home - Finishcarpentryhelp.com.